The ICCASCE 2015 conference covers a wide range of fields in science and engineering innovation and aims to bring together engineering technology expertise. Scientists, scholars, engineers and students from universities, research institutes and industries all around the world gathered to present on-going research activities. This proceedings volume consists of papers covering a range of topics in Civil, Architectural, Structural and Constructional Engineering and Advanced Materials and Mechanics, a hot topic in engineering in the last decades. Recent trends show that the application of nanotechnology and environmental science together with advanced materials and mechanics are playing an increasingly important role in different engineering applications. 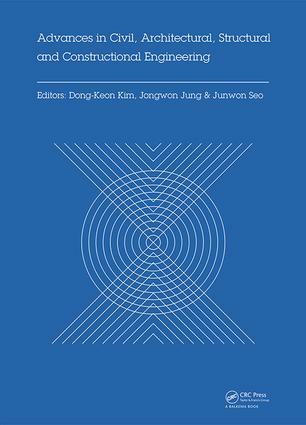 Covering this trend, this volume provides both theoretical and practical applications in the advanced engineering analysis of materials for the Civil, Architectural, Structural and Constructional branches, incorporating these along with the latest analytical techniques, instrumentation, and regulations. This book covers various topics such as advanced construction materials, smart materials in manufacturing and materials science, smart structures and systems, vibration and noise control, informational technology of materials, power conversion and intelligent control and fluid dynamics among others. Furthermore, the authors provide guidelines to researchers and engineers, enabling them to prepare and understand the materials and construction responses and analyses. The analytical methods presented in engineering applications and analysis for materials will be useful to anyone who produces, uses, or evaluates construction data, and will be a valuable tool in advanced engineering education and training programs. The influence of nutrient medium and growth regulators on in vitro morphogenesis of Thuja occidentalis L.
Professor Dong-Keon Kim is a tenure-track assistant professor in the department of Architectural Engineering at Dong-A University in the Republic of Korea. Prior to attending Dong-A University, he was a research professor in Hanyang University and senior researcher at Central Research Institute in the KHNP (Korea Hydro & Nuclear Power). He received his MS degree from the School of Civil and Environmental Engineering in Georgia Institute of Technology and his Ph.D degree from department of Civil, Structural, and Environmental Engineering at the University at Buffalo. Professor Jongwon Jung is a tenure-track assistant professor in the Department of Civil and Environmental Engineering at Louisiana State University in the United States (US). Prior to attending Louisiana State University, he was a post-doctoral fellow in Lawrence Berkeley National Laboratory and adjunct professor at San Jose State University in US. He received his B.S., two M.S. and Ph.D. degrees in Department of Civil and Environmental Engineering - Geotechnical Engineering from Korea University and Georgia Institute of Technology, respectively. He also worked in Dong-Yang Engineering as an assistant senior engineering during 3 years after receiving B.S. Professor Junwon Seo completed a Ph.D in Structural Engineering at Pennsylvania State University in 2009. Before that, he completed an undergraduate degree in Civil Engineering at Konyang University, South Korea, and two postgraduate degrees in Structural Engineering at the Georgia Institute of Technology and Yonsei University, South Korea. He has published several papers in the field of bridge engineering, engineering structures and building materials.